There's nothing quite as on-trend at the moment as kraft with black printing and brown hessian rope. We shiver with delight when clients ask for this style because we absolutely love it. It's simple, cost effective, and we don't ever get bored of it! There are always ways to make each invite unique. 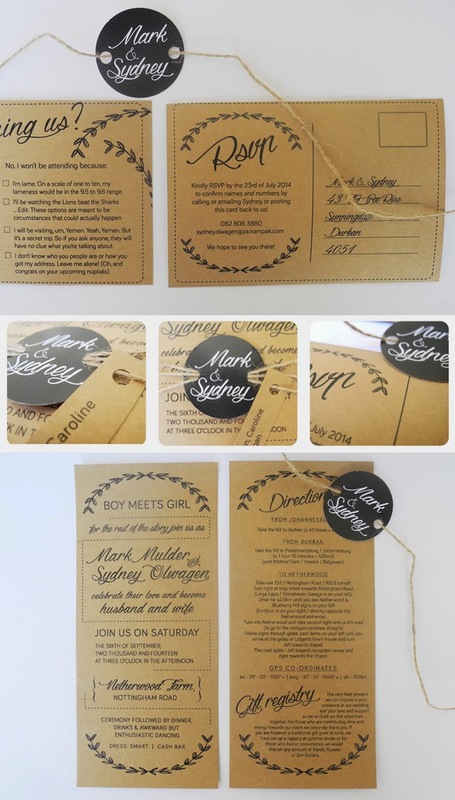 For Sydney and Mark, we opted for a rounded disc with their names, held together by delicate strands of hessian rope. Each guest's name was roped onto the hessian making it a personal gift to each recipient. Their invitation pack consisted of a ceremony card, directions and guest information card as well as a really fun RSVP postcard.